Uglyworld #659 - Chilly Cinko (202-365), originally uploaded by www.bazpics.com. With the weather in Oregon getting up into the 80's today Cinko was beginning to feel the heat, so tonight I promised him that we would go find him some ice-cream. Being a massive "sorbet" ice-cream fan myself I suggested that Cinko should try a different flavour from his normal mint choc chip which has pretty much dominated his ice-cream munching thus far. 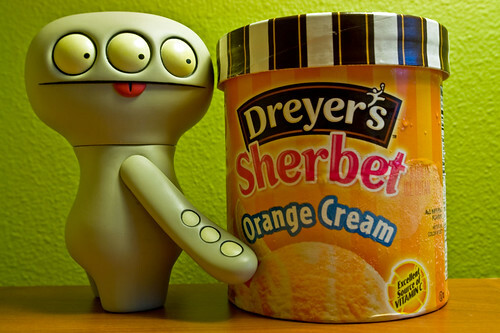 The second he tasted this Sherbet Orange Cream from Dreyers he was sold, "wowzers, baz cans we buys a big tubs of this, is awesomes, reallys, makes my tongue tingles too!". Right now he's lying on the bed tucking into the tub, but I have warned him that he needs to make it last until the end of the week as it is quite a large tub!